What a great time to be a Chamber member and Greater NOLA resident! (come on, you can put up with the Super Bowl traffic for a little longer) It is great to have so many visitors coming to town, let’s do our job to make them feel warm and welcome. With the airport and major interstate highways located in our parish, we’re getting to show off to everyone coming to the city. Make the best of it! Join us on Twitter as we share interactive maps of where visitors can find member hotels, restaurants, Mardi Gras throw providers & more! Better yet, tell everyone to download MyChamberApp on their Smartphone. 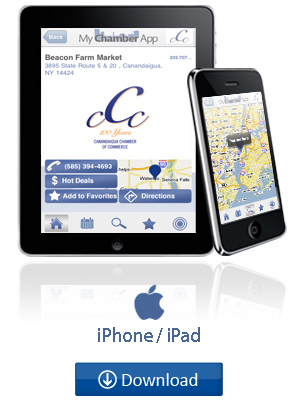 This is a FREE app that anyone can use to find LOCAL businesses here. If you are a member of the Jefferson Chamber, you’re in this app. Oh, the things you’ll learn if you stick with us. Now on to the Chamber updates… Those of you who have been visiting our Facebook, Twitter or website lately have seen some big changes! I have the pleasure of introducing to the rest of you, the new Master Brand Logo of the Jefferson Chamber of Commerce! Inside the design: This logo represents our organization from 2013, forward. The big and small building represent the different sized businesses we serve, the sunburst to show a new day, new life. If you look closely at the design of the buildings, you can see arrows pointing up at the sky, representing growth of business and our members. The color blue represents business and conservatism while the fonts portray a transition from classic to modern. -A perfect picture of our evolving community. It’s not every day that you can take a Journey song and make it a business practice. But then again, they are one of the best selling bands of all time! So, we’re taking their advice. “Any way you want it, that’s the way you need it.” As a Chamber member, there are many different ways that you can stay informed and connected to the Chamber and business here in Jefferson Parish. Here’s a quick list of ways you can stay informed. You just pick the way you need it. Email: At the bottom of every email we send is the link “Update Profile/Email Address.” By using this link, you can choose which emails you want to receive from the Chamber. Choose from weekly and monthly updates. Need to add someone in your company to the email list? Just have them go to our website, scroll to the bottom and enter their email address in the box. Easy. Member Dashboard: By using the Member Login portal on our website, you have the opportunity to market your business to consumers visiting jeffersonchamber.org by enhancing your informational Home Page with pictures and text . You can also post Hot Deals , job openings and events, add keywords to help consumers find you when they run searches, and run reports to see hit statistics for your home page and other advertised items. Can’t remember your log-in and password? You now have the ability to setup your favorite social media site login to access your Dashboard. Soon, you’ll have the ability to post news releases and create individual log-ins for people within your company. e.g. a Billing rep will have different access than a sales rep or CEO/Admin. Facebook: Check out all of the latest pictures from events and get facts about your Chamber membership. LinkedIn: Share B2B insight and best practices and discuss issues facing the Parish and the Chamber. Blogs: Now online! Get information about membership, communications, special events, the Chamber president, our Foundation and more just by following our blogs. MyChamberApp: Chamber members and info in the palm of your hand! Snail Mail: We have that too! Be looking for a letter each month from us talking about what we’re working on and how it can help your business grow! Fax: Yes, we still have a fax number @ (504) 835-3828. Make sure to look for us on TV, on radio, billboards in the newspaper and more. Make sure you point it out to your friends and tell them all of the great things the Jefferson Chamber is doing!